Entier, the Westhill, near-Aberdeen based catering, hospitality, event and technical services company with recognised brands of RSG, FRESH, Wilde Thyme and Entier Technical Services, has again demonstrated its commitment to putting people at the heart of everything it does through its support of newly-turned professional golfer, Sam Locke, winner of the coveted Silver Medal at this year’s Open Championship at Carnoustie in July. Locke, from Stonehaven, took the decision to become a Pro just a week after his incredible experience in one of golf’s Major Championships and is now beginning to learn his trade through competition on the European Challenge Tour. And the nineteen year old can now count on the backing of one of the country’s most passionate and committed firms, as he begins his journey. 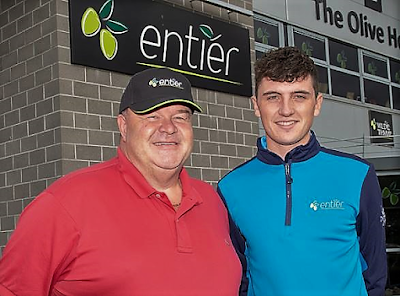 Renowned for their investment in people, entier have a strong track record of helping talent to thrive. Their Fresh Olives programme is designed to uncover and nurture talented individuals within the catering world and help them to maximise their potential. This same passion is evident in their approach to CSR and investing in the communities in which they operate. Entier Ltd is Scotland's largest independent contract catering and support services company, created in 2008 to meet the evolving requirements of the oil and gas industry as well as having a significant presence in the education and business sectors. The firm has its headquarters – The Olive House – in Westhill, Aberdeenshire.